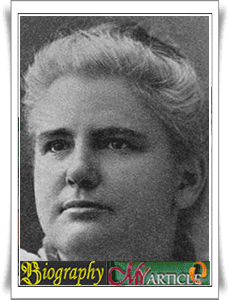 The leader of the movement in the fight for women's suffrage in the United States, Anna Howard Shaw, born on February 14, 1847 in Newcastle United Kingdom. When he was two years old, he and his family moved and settled in Lawrence, Massachusetts, United States. After living six years in America, his father bought a plot of land in Michigan. Although it is still 12 years old, Anna is remembered, with all the difficulties that he had his family in their efforts toward Michigan. They can just catch a train up to Grand Rapids which is still far from Michigan, so proceed with using the cart and drove 100 miles during the week, where in the course of the road and little to no directions. After they arrived in a small house in the middle of the forest, the father returned to the area east of the oldest brother, along with two of his men and left the rest. Anna and her father left the family back to Eastern regions should strive to conserve stock was taken because the nearest store is 10 miles and can only be traveled on foot as well as the available items are also limited. When he was 15 years old, Anna signed up as a teacher at a school which is five miles from his home, and he got in return for $ 2 per week. After a year later, he moved to a school in Big Rapids and then became a pastor in the Big Rapids. To support his family, Anna to travel and preach in many places because of the men in his family were involved in the civil war. In 1873 he started education at Albion College with only bring money for $ 18 when you first got there that makes him return to call people to earn an income. Then he got the chance to be educated at Boston College and majored in religious studies there. In fact he did not approve of Anna's family became a pastor for educated so that his family could never have helped all the necessary needs and make Anna became often run out of money to meet their daily needs. After completing his education, he was preaching in a church in East Dennis, Massachusetts. In 1885, he continued his education at the school of medicine, because he thinks if he can become a doctor, he can help poor people around him. Growing up, Anna is increasingly aware of the lack of rights that are owned by women. During active in the women's Christian Temperance Union, he always talks about the backlash against alcoholic beverages. He used to preach in various places so that everyone is willing to listen to any charity which he gave. Anna traveled to all corners of the country and talking about the women's suffrage. Finally in 1920, the United States Government issued a rule that would allow women to have suffrage. Anna died on July 2, 1919 at the age of 72 years due to pneumonia.